A number of recent articles, papers and forums have stated there is a direct relationship between strong a El Nino and higher year to year CO2 ppm rates of change. I've looked, but not found a piece that directly builds the relationship, so this post attempts to explore that relationship. A recent blog post demonstrated the trend in the monthly global CO2 increases as one, five and ten year comparisons, through October, 2016. It was created using the NOAA/ESRL monthly global CO2 data. 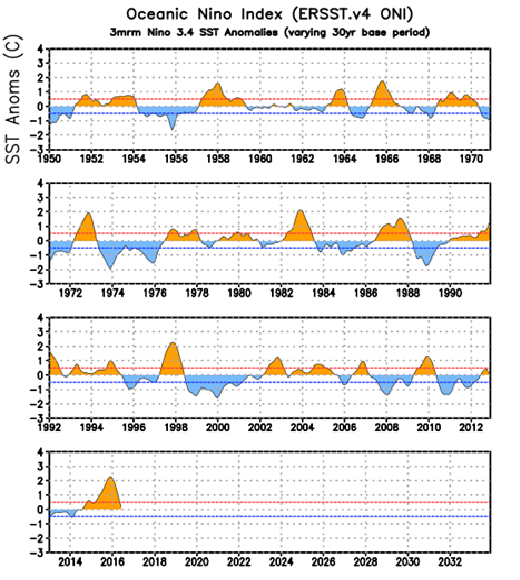 What was needed to explore the relationship with El Nino or La Nina was the SST anomalies. Curious about the relationship between ENSO 3.4 sea surface temperatures (El Nino or La Nina), I pulled the monthly ERSSTv4 (centered base periods) Niño 3.4 (5o North-5o South) (170-120o West)) that is used to provide the monthly input to the Oceanic Nino Index (ONI). The red line above represents the climate base adjusted ENSO 3.4 sea surface temperature anomalies from January 1981 to October 2016. The blue line is the monthly NOAA/ESRL CO2 change compared to prior year for the same month. The added trend lines reflect the increasing rise in CO2 emissions change and demonstrate that the ENSO 3.4 temperatures seemed to decline slightly from 1981-2016, due to lower SST anomaly peaks after 1997-1998 and before 2015-2016. What is apparent from the image, is that some El Nino events are followed by spikes in CO2 emissions, but not all. There are some CO2 increases that are not related to an El Nino event. That is a serious concern. Now the details in chronological order focused on El NIno events and the potential relationships with increases or declines of CO2 change rates during or after the El Nino. This El Nino peaked in December, 1982, with a very strong sea surface temperature anomaly of 2.21 C above the base. It was followed 8 months later, in August, 1983, with a spike in the yr/yr CO2 increase of 2.51 ppm. This El Nino peaked in September, 1987 with a strong SST anomaly of 1.66 C above the base. 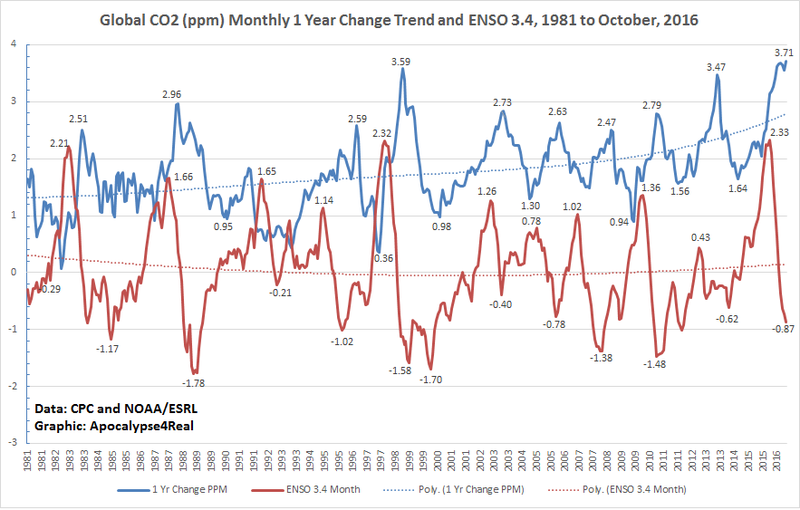 The CO2 peak came five months later when the CO2 over prior year was 2.96 ppm higher than prior year. Moreover, this was the longest run of CO2 increases of more than 2 ppm, until 2002-2004. Seventeen months, from December 1987 to April, 1989 experienced these unprecedented increases up to that date. This El Nino peaked at 1.65 C above its base climatology in January, 1992. What make this event interesting is that there is no corresponding spike in CO2. In fact, CO2 yr/yr increases had dropped below 1 ppm over prior year beginning in October, 1991 and did not rise above that level again until December, 1993. This is generally attributed to drop in CO2 emissions brought about by the end of the Soviet Union and accompanying industrial output declines in Russia and Eastern Europe. While too short a period to meet the official description of El Nino, this increase in SST anomalies peaked in December, 1994 at 1.14 C above the base. Four months, from September to December, 1995 witnessed CO2 monthly increases over 2 ppm. These did not spike till 10 months after the peak SST anomaly, in October, 1995 when the CO2 increase hit 2.16 ppm above prior year. What does not fit the El Nino driven CO2 increase model is that after a brief decline in early 1996, the increases over previous year jumped to 2.59 ppm in July, 1996. This peak was followed by a decline in CO2 increase below 1 ppm during June to September, 1997. The 1997-1998 El Nino was the strongest since 1877-1878. It produced a SST anomaly spike of 2.32 C above the base climatological SSTs in November, 1997. This El Nino was followed by a CO2 yr/yr spike of 3.59 ppm ten months later, in September, 1998. The run of CO2 increases over 2 ppm per month continued from April, 1998 to June, 1999. For the first time, three of those months were over 3 ppm compared to the prior year, those of August to October, 1998. Although this El Nino was followed by a extended strong La Nina, only one month, June, 2000 dropped below 1 ppm (.98). Any effects of La Nina potentially slowing a CO2 increase seem to have been overcome by other factors for by February, 2001, the CO2 increase compared to prior year was again running above 1.5 ppm. When the El Nino started in June, 2002, it pushed the CO2 yr/yr change over 2 ppm by August, 2002. For the next 21 months, CO2 monthly increases remained about 2 ppm, until April, 2004, even though this El Nino ended in nine months, in February, 2003. The 2002 El Nino peaked in Novmber, at 1.26 C above the base, however the CO2 increases did not peak until seven months later, in June 2003, at 2.84 ppm over prior year. The 2004 El Nino continued for nine months, peaking at .78 C in January, 2005. This very mild El Nino led to an almost 15 month stretch of CO2 increases about 2 ppm per month. The CO2 increase peak occurred 14 month later, in February, 2006, with a 2.63 ppm jump over prior year. The last month with a 2 ppm increase associated with this El Nino was July, 2006.However, after this, only one month experienced less than a 1.5 ppm increase until the next increases of 2 ppm or above commenced. While this stretch of El Nino-like SST anomalies was too short to qualify as a true El Nino, it may have been enough to nudge CO2 yr/yr increases back over 2 ppm. The El Nino temps peaked in December, 2006 at 1.02 C, however, the CO2 increases over 2 ppm do not start until eight months later, in September, 2007. It seems outside the range of plausibility, but the peak CO2 increase with this El Nino temperature run does not come until 19 months later, in July, 2008, during the La Nina of August, 2007 to June, 2008. This La Nina, which peaked at -1.38 C in January, 2008, may have contributed to the CO2 yr/yr increase decline to a low of .89 ppm nineteen months later, in August, 2009. This El Nino ran for eight months, peaking at 1.36 C in January, 2010. It pushed CO2 yr/yr increases back above 2 ppm commencing in April, 2010 and continuing for almost 15 months, till June, 2011. The CO2 increases peaked eight months after the El Nino temperatures, similar to some of the previous events. In September, 2010 it hit 2.79 ppm over prior year. This El Nino was followed by two La Ninas. The first from July, 2010 to April, 2011 only dropped CO2 increases back to 1.56 ppm in September, 2011. This event occurred during the second La Nina, which ran from August, 2011 to February, 2012 when there was a one month drop to 1.69 ppm yr/yr increase in June 2012, seven months after the lowest SST anomaly in the 2011-2012 La Nina event. While SST anomalies returned to ENSO neutral in March, 2010 and would remain in that state until October, 2014, there was an anomalous increase in CO2 emissions without the strong El Nino that it should "normally" have been associated with. From August, 2012 through February, 2014, the monthly yr/yr CO2 emissions increased over 2 ppm each month. During this 19 month period, from June to August 2013, they increased more than 3 ppm per month, peaking at 3.47 ppm in July, 2013. The only other times this level of CO2 increase was observed was in association with the 1997-1998 and the April, 2015 to May, 2016 El Ninos. Two contributing factors to the unprecedented rise may have been drought and forest fires, or increasing economic growth, but exploring those reasons is outside this posting. Prior to the return of El Nino, SST anomaly temperatures in November, 2014 to January, 2015, popped CO2 yr/yr emissions changes back over 2 ppm. Since January, 2015, no month has gone below a 2 ppm yr/yr increase in CO2 levels. The most recent El Nino started in April, 2015 and peaked in January, 2016 with a SST anomaly of 2.33 C. This very strong El Nino pushed monthly yr/yr CO2 increases over 3 ppm in January, 2016, and they may have peaked in October, 2016 with a 3.71 ppm increase over prior year. 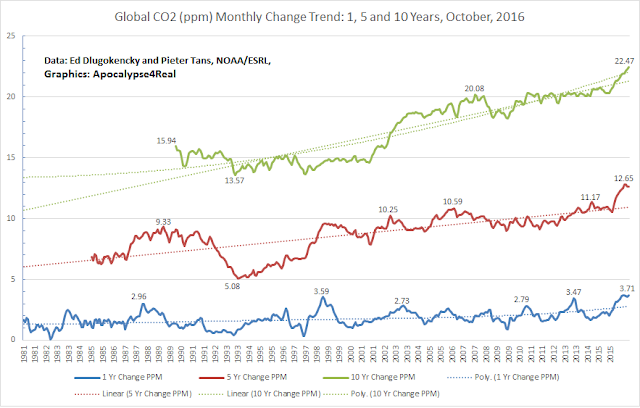 These monthly increases above 3 ppm still continue as of October, 2016. While there are plenty of examples of an El Nino SST anomaly from 1981 to present with a delayed associated increase in CO2 yr/yr change, there are also events that are anomalous. Especially troubling is the capability for CO2 increases to occur without an El Nino as a precursor condition as seen from August, 2012 to February, 2014. Of even more concern is that we have continued to experience yr/yr increases at higher rates. Even with a mild La Nina or ENSO neutral conditions, given the yr/yr increases above 3 ppm for so many months after the most recent El Nino, it seems less likely that we will see a drop below a 2 ppm rate in the near future. Despite human CO2 emissions leveling for the last three years, we may now be entering a state where natural feedbacks are driving future CO2 yr/yr and overall ppm increase. That is a tipping point we need to avoid.